If I had to sum up what Magnificent Seven did right and wrong in one sentence: they had a lot of good moments, but not such a great story binding all the moments together. The experience proved something of a mixed blessing, though. It was a somewhat fun, fairly enjoyable movie, I will say. It was gritty and action-packed and who doesn’t love a good shoot-em-up western, eh? That said, there are a few ways in which something was left to be desired. Perhaps part of that is because I’ve seen the exact formula so many times already. Seriously, this is at least the fifth version of the story I have seen. 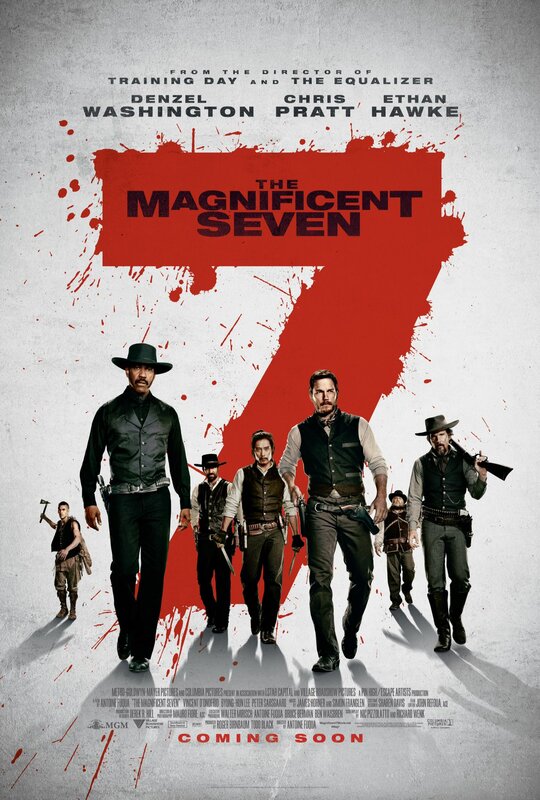 I’ve seen the original Magnificent Seven, and its sort of sequel, and the television show. I’ve also seen the anime Samurai Seven, which is inspired by the real “original” tale, Akira Kurosawa’s Seven Samurai. And that is the one version which I have not yet seen, though I really want to. So, needless to say, this remake is not a “new” story for me. It’s a bit difficult, then, to not compare and contrast this Magnificent Seven with all the others. This is not helped by the number of Mag-Seven tropes that are utilized, and I recognized new versions of older scenes. As a result, this movie might be its own standalone story, but it doesn’t really “stand alone,” ya know? It can’t be kept entirely apart from the other versions of this story, unless one never sees them. In that contest… well, it felt kind of weak. Let me be clear: this movie tells its own story, about a band of rejects – not just outcasts and misfits, rejects – fighting on behalf of poor, oppressed farmers, and coming together as brothers in arms. But every other version of the Mag-Seven story has a great amount of character development. By that, I mean they either change or build or reveal who these people are. They didn’t do that this time, or at least not much of it. Without that, the narrative felt pretty loose and simplistic. Begin conflict, introduce the seven, first encounter with the enemy, prepare for the second fight, and fight. None of the other Mag-Seven stories were either that simple or that bare of character development. Perhaps the greatest “lack” on that score: with every other version of the seven warriors, they all enter into and stick with the fight as a matter of honor. We didn’t see much of why the heroes did what they did, but for Washington’s character, Sam Chisolm, it seemed to be about revenge. Very well-warranted revenge, mind you, but, still, revenge is not the same as honor. Basically, while I enjoyed the ride, when we got to the end of the movie, it felt kind of “flat” somehow. Even so, they did fairly well making me care about these seven men and the people they led into battle. They each had their “I am crazy” idiosyncrasies, a way in which each of them was “broken” as a person. They all had their talents and skills as well, and I really liked how they ribbed each other, their camaraderie in the face of certain death. I also liked how they didn’t have the token female character be a romantic interest to any of the seven. She was more like an honorary “eighth” member of the seven. And, as I said, I did enjoy the ride. The battles and gunfights were pretty well done, realistic and standing apart from most other western fights, not to mention the heroes’ humorous wit in the midst of their self-sacrifice. There were small, quick, personal confrontations as well in the middle of the mutual slaughter, though that also left me wanting more of the “personal” element (ie, character development). The soundtrack was nice enough too, though the fourth time we heard the thematic horn/trumpet, it had gotten a little repetitive. I suppose I am mildly disappointed partially because of the inevitable comparison with other versions of the story, and partially because I was just expecting more from this film. Still, in fairness, it passes as fairly decent, and I wouldn’t mind owning it. This entry was posted in Movies, Tuesday Review and tagged Chris Pratt, Denzel Washington, Magnificent Seven. Bookmark the permalink.